OK guys, I finally made an Archer! This is the product of another sewcial sewing endeaver - a Sew Bossy trade with the adorable Amber of Tangible Artiste. (Click here to see Amber's make). 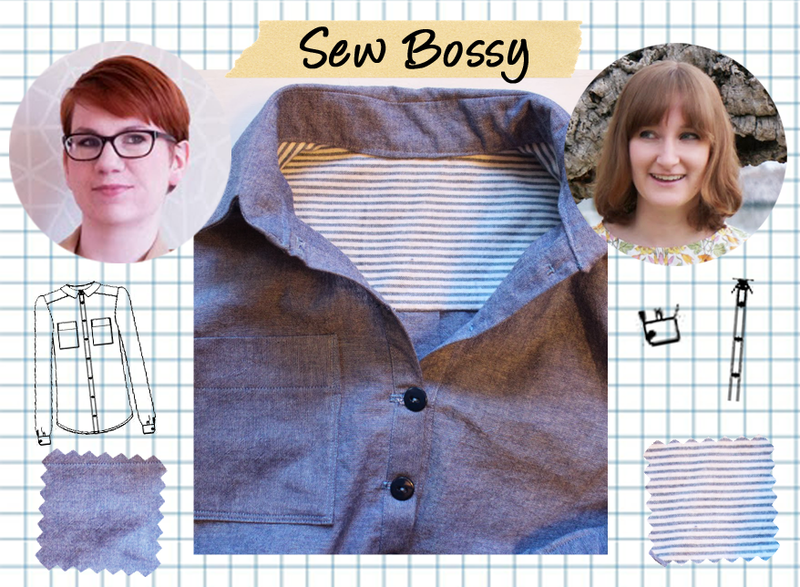 The most fun part of Sew Bossy is that it really creates a collaborative project - you get all the supplies and the pattern, and then can manipulate them to create something uniquely your own. Neither participant knows quite what the finished product will look like, but some amazing collaborations have come out of it. I also used this opportunity to try out another tutorial - Off the Cuff Style's Perfect Collar Points. This tutorial actually worked quite well, and is based on the wisdom of a long-time custom shirt maker. She says: Custom shirt makers NEVER pivot where they want a point, and NEVER poke their points out with a pointy objects. Of course, she says, If you Pivot and Poke and are happy with your results, then I am NOT the self-appointed Point Police Officer! She had me won over, and her simple technique was flawless! Maybe it's because I haven't done a proper collar in a while, but this is quite possibly the best one I've ever done. Lastly, I ALWAYS wear my button up shirts rolled up to my elbows, so at the last minute I decided to forgo the cuffs and just hem the sleeves and roll them up. It's a casual weekend shirt anyway, right?! I do believe I will make this pattern again, either with the full placket or another half one. If I want a version I can wear to work, I will also want to make the shoulders just a bit narrower, although I believe the pattern is intended to look a bit over-sized around the shoulders. I really like the button placket but I think I'm too scared to try it myself!! Love it! It looks so cute on you! I've been wanting to do a half placket too but I had no idea how. When I made my archer I went down like 3 sizes or something to get it to fit tighter. This was so much fun to do with you, we'll have to collaborate again! I also really love the continuous button placket! It's such a great casual shirt! I'd been thinking about how one would adapt the Archer to do this and I'm so happy you posted those links! oooh your Archer looks nice! Couldn't tell something is off with the button placket. Looks like an easy method though, I never tried it this way before. Looks much easier than making it with two separate pieces of fabric. A gorgeous, comfy shirt, especially important if just to lounge or run around on the weekends. I love it!! Now I want to make a popover version too!